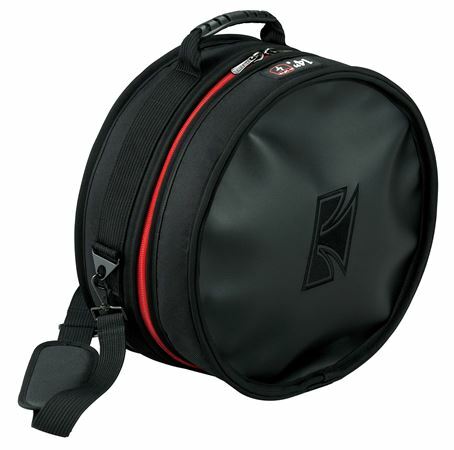 Shop Tama PowerPad PBS Padded Snare Drum Bag from AMS and enjoy Fast & Free Shipping. The Tama Powerpad Snare Drum Bags protect your snare from the rigors of the road! These heavy-duty bags are designed to provide excellent protection, while being easy to use and light in weight. Internal bag construction includes a semi-hard cushion material for extra protection and an inner flannel fabric material to prevent scratching. The exterior surface utilizes strong 1200 Denier high-density nylon and a water-resistant fabric material for added protection. Heavy-duty zippers with Tama zipper pull provides smooth, durable action that is easy to grab. Handle with rubber grip and wide shoulder strap with pad provide comfort during transport. Bass drum bags include rubber grip top handle and envelope grip side handles. Adding this bag to your at least $300 snare drum is a must! Well padded and works well for transporting your snare drum, fitment is spot on! Thanks Tama for making quality products, and thanks AMS for always helping me with my product purchases!